ISIS begun their assault of one of the Iraq’s largest military bases. The Sunni terrorists held a massive military parade in Abu Ghraib in March. But only recently took control of the key cities in the region. 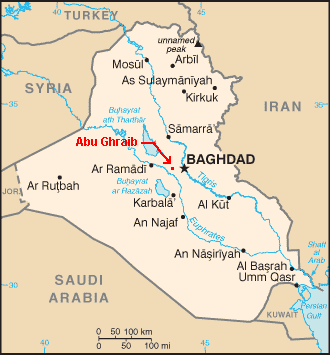 ISIS has taken complete control of Abu Ghraib west of Baghdad. The Islamists are now within artillery range of Baghdad. Islamic State militants have taken control of key cities in Iraq’s western province of Anbar and have begun to besiege one of the country’s largest military bases in a weeklong offensive that’s brought them within artillery range of Baghdad. The Islamic State and its tribal allies have dominated Anbar since a surprise offensive last December, but this week’s push was particularly worrisome, because for the first time this year Islamist insurgents were reported to have become a major presence in Abu Ghraib, the last Anbar town on the outskirts of the capital. …A diplomat in Irbil, the capital of the autonomous Kurdistan region, said an Islamic State presence in Abu Ghraib would put Baghdad International Airport within artillery range of the militants. Once again, ISIS posted photos today of the arms they captured in fighting north of Baghdad.